iOmniscient has been a leader in using Artificial Intelligence technologies to create solutions for a host of industries- from Oil and Gas to Smart Cities. We have pioneered AI techniques that have created a new paradigm to analyse data from crowded and complex environments and provide the user with real time responses. Artificial intelligence enables our systems to have high levels of accuracy and low false alarm rates even in difficult situations. 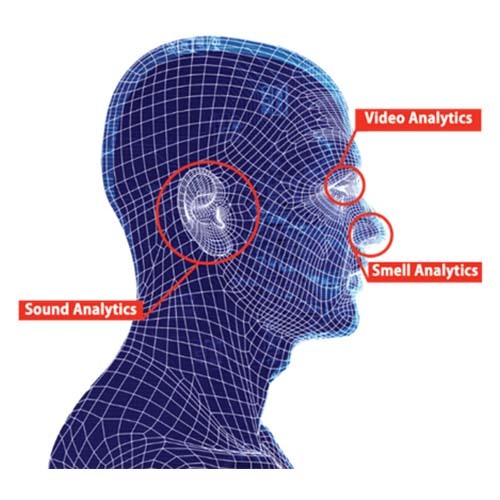 Bringing together a number of different video, sound and smell analytics technologies, iOmniscient systems can automatically find the nearest responder with information on where to go and what to do. This can reduce response times significantly which is important for Mission Critical Applications. Such systems enhance your productivity and increase the return on your investment. iOmniscient is the only provider of intelligent systems that can simultaneously perform Behaviour Analysis (for a multitude of behaviours) and Recognition (Face and License Plate Recognition) in crowded and complex environments. The Face Recognition system can recognize faces at a significantly lower resolution than any other system. Our intelligent systems can recognise license plates for 130 countries. These capabilities are modular and can be combined to solve complex problems. All Big Data analysis is based on “text data”. Our systems can convert everything that is seen, heard or smelt by the system into Meaningful, Multimedia Metadata (MMM) – which is essentially text. This enables very fast analysis of data for forensic investigations. As the system is able to eliminate noise which is usually 90% of the data, it helps to speed up the search and analysis even further. Security and safety are increasingly important in crowded spaces. The complexities of obscuration and ambiguities in crowded scenes, as well as the complex behaviours and scene semantics, make video analysis a challenging task. With multiple patents for analytics and recognition in crowded spaces, iOmniscient has deployed its unique intelligent systems for complex and crowded scenes for high profile customers around the world. We provide them with the ability to analyze crowds, day and night, indoors and outdoors, and with real time information and response capability. HOW SMART ARE YOUR SYSTEMS? Evaluate how smart your system is by understanding it's IQ. For the sophisticated customer who wishes to implement very advanced Use Cases, iOmniscient can offer a comprehensive set of services on a Turnkey basis. The services can range from Systems Design, and camera selection and placement, to configuration and ongoing operation of the system. Certification training is also available for those who wish to implement the systems themselves and for operators who will be using the system. Our technology team can provide professional advice on optimal camera selection and placement to meet your operational and risk mitigation requirements. We provide 24×7 support through our support centres that can cope with issues in English, Spanish, Arabic, Mandarin, Hindi, Tamil, Korean and Indonesian. Our products are continuously improved and upgraded to include the latest technologies.